Sean Fargo is a mindfulness consultant and coach based in Oakland, California who spent two years as a Buddhist monk in Thailand. 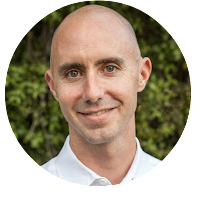 He’s the creator of MindfulnessExercises.com and offers an online mindfulness teacher training program. As a former monk, what’s your perspective on the ongoing debate (especially in public schools) about whether secular mindfulness teaching is really Buddhism in disguise? Most secular mindfulness teachers (including myself) define mindfulness as “non-judgmental, present moment awareness of one’s experience”, which is comparable to how the Buddha defines mindfulness. So secular mindfulness and “Buddhist mindfulness” are, in my mind, the same thing. Both start with course practices, leading to very subtle and refined states of awareness without judgments of good or bad, right or wrong. But here’s the thing: mindfulness is not in and of itself “Buddhism”. Buddhism is based on The Four Noble Truths, of which mindfulness is a part, along with thousands of other teachings on karma, rebirth, wise intention, livelihood, concentration, etc. The truth is that most Buddhist lay teachers I know don’t even believe in karma and rebirth. I personally do, but most don’t. And those that do believe in karma or rebirth (or other hard-core Buddhist teachings) certainly won’t broach these topics with their secular clients. So this notion that secular mindfulness teaching is really Buddhism in disguise does not hold water for me. Besides, the Buddha himself was not Buddhist. He was simply awake. That’s all a good mindfulness teacher can hope to share: wakefulness. On the other hand, there are concerns in the Buddhist community that secular mindfulness is cut off from its spiritual and ethical roots. Did you have any misgivings when you started working in a corporate setting? Was there anything that surprised you? When I first began dipping my toes into secular waters, it initially felt cold to me. From the outside looking in, it seemed that working professionals just wanted mindfulness as a shortcut to decreasing their stress so that they could get more done at work. It seemed there was a void of heart and, consequentially, a void of intention to unlock deeper spiritual truths of interconnection. But fortunately, when I actually began coaching real teams and executives (ie: real people with real emotions), I always found underlying wishes for respectful communication, wise perspective, meaningful purpose, and caring connection. Mindfulness – true mindfulness that is without judgment - is a gateway to all of these outcomes. One cannot cut the branches of freedom from the roots of mindfulness. What kind of clients benefit the most from mindfulness coaching, and what qualifications should they look for in a coach? Generally speaking, everyone can benefit from an outstanding mindfulness coach. We as humans have the remarkable skill of avoiding our blind spots. Mindfulness coaching aims to bring everything into clear visibility, especially the stuff we don’t want to look at, including body language, verbal language, emotional reactions, beliefs, stories and expectations. Of course, if there is significantly unresolved trauma or psychiatric condition, then speaking with a trained therapist first would be wise. Some of the best mindfulness coaches don’t have great websites, so it can be tricky finding a great coach. As a rule of thumb, try to find one who teaches at leading meditation centers (Spirit Rock, IMS, IMC, etc.) or who works with large companies (via Wisdom Labs, SIYLI, etc.). In working with all of them, I can vouch for the integrity and skill level of these groups. Regardless, look for mindfulness coaches who have rock-solid testimonials from people you respect. The bottom line is that the best mindfulness coaches do it with a sense of compassion, not to get rich or famous. Feel them out, try several sessions, and then see if the people close to you notice a difference in your way of being. You’ve also led mindfulness classes and workshops in prisons. What kinds of mindfulness practices work well for incarcerated adults? Some high-security inmates are among the most inspiring people I know. Locked up for decades, many of them are completely transformed by what we call “sitting in the fire”: sitting with themselves day after day in their cells breathing, remembering, burning, purging, apologizing, forgiving, breathing, suffering, crying, empathizing, forgiving, resolving, breathing, regretting, sharing, cleansing, breathing, acknowledging, releasing, serving, helping, breathing. When you begin within a heavy shell of self-contempt, sitting in your fire is the toughest thing you can do. Teaching mindfulness to these guys, I typically begin with non-threatening practices like soft belly breathing, then segue into body scans (usually related to emotional regulation), followed by something juicy like compassion or forgiveness. By the end, you’d be surprised to see how many ‘hardened criminals’ open up about their feelings in front of their peers. Finding freedom behind bars is no small thing. It’s why I became a hermetic monk for 2 years, to know how to do that. Be the example. Be with your clients moment by moment by moment with a sense of non-judgmental curiosity. Most of my clients say it’s not what I say that’s so powerful. It’s how I am. This is actually why I dove head-first into these practices. My first mindfulness teacher was an old Tao’ist master who couldn’t speak English very well. Sitting together for 1 ½ years in northeast China, his mindful strength, peacefulness, and kindness spoke to me more than his rhetorical acuity. So again, it’s about being the example. One of the benefits to being a professional mindfulness consultant is encountering so many helpful practices. It’s like being a kid in a candy shop, except the candy is actually good for you! Formally, I often practice mindfulness of breathing (at the nostrils), opening to feelings of comfort and discomfort, tonglen (a form of Buddhist meditation related to suffering and compassion), noticing raw sounds and tastes, mindful walking, and gratitude. My daily intention is to be mindful at all times, especially of my judging mind. I tend to judge things as good or bad, right or wrong, which is tied to an implicit expectation for something to be different that it is. It’s fascinating to see how much contraction I can feel as a result. The more mindfulness practice I do personally, the greater my repertoire professionally. My path is not unique. We are all on this wild, mysterious human ride together. I just hope to help people feel a little more ease along the way.